Our family is getting ready to start this Easter Tradition that we started last year. In case you and your family want to get started also, here is run down of how our 12 Days of Easter, works. Are you looking for a great family idea for celebrating Easter? Do you want your children to know there is more to Easter than Candy? That is why we do the 12 Days of Easter. Want to join us? In order to finish on Easter Sunday, you will want to start (open your first egg) on Wednesday March 28th. That is this Wednesday. No worries it is really easy to get this activity prepared. You probably have everything you need at home already. If you want a shorter 7 day version, I will include it at the end of the post. Remember the Easter Egg Garland we made two weeks ago? That is how I am going to display our eggs. Open one egg each night before we say family prayer. Our 3 year old will get to pick the egg off the garland because she is learning her numbers. Our 7 year old will read the short summary. Our 9 year old will read the scripture reference and the scripture. Then we will all discuss its meaning and what the small item represents. So glad you love the post, and idea. Welcome to Family Volley. 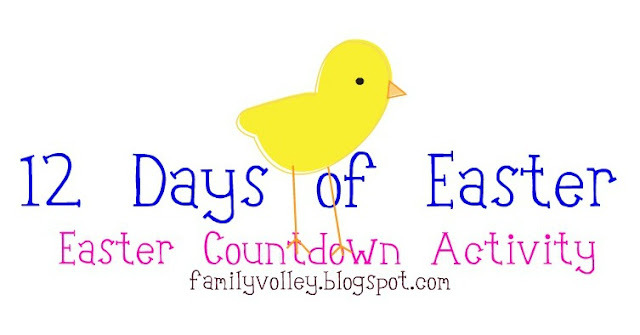 Our kids love this activity and I have really loved how it helps them understand that Easter is about more than candy. Hope you make the garland too..
My mother made a set for my family years ago and my children LOVE it. The eggs sit in a decorated egg carton with a picture of the Savior pasted to the top. For FHE the week before and again on Easter Sunday, we hide them around the house and let each child find three eggs. Then we sit together and open them in order to tell the Easter story. I usually supplement with pictures to help little ones stay focused when it isn't their turn to open an egg. This is our children's favorite Easter activity--they would do it every day if I was up to it! We also make Easter cookies on Saturday evening. Each ingredient represents a part of the Easter story (salt, vinegar, sugar, beating egg whites, etc.) and when the cookies are formed you seal them in the "tomb" (the oven) overnight. In the morning they have risen (just like our Savior) and are hollow and empty inside (just like the tomb). My oldest especially enjoys this activity. It is another reminder for our family of the true meaning of the season--and this one tastes pretty good too!